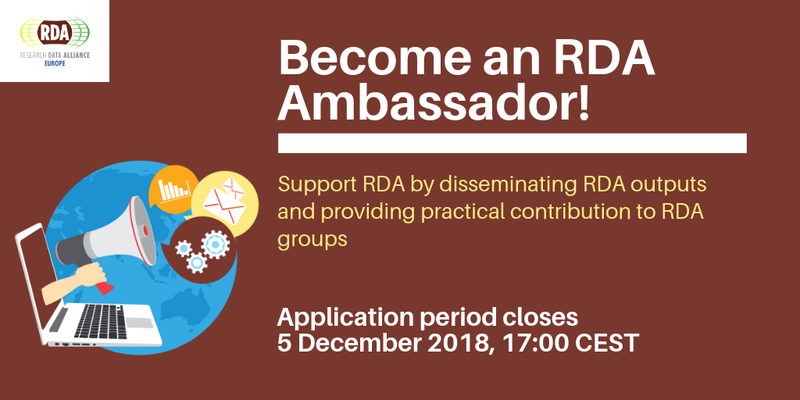 Call for RDA Europe Ambassadors now open! Home » News & Articles » Call for RDA Europe Ambassadors now open! RDA provides an open forum where solutions are discussed, and experiences shared: its community-driven and bottom-up nature ensures continuity with current best practices and integration of contributions from researchers across domains, national, geographical and generational boundaries. The RDA EU Ambassadors programme offers up to six grants of a maximum of €7,000, targeting distinguished and well-connected domain experts who can develop a two-way communication and engagement vector: on one hand by disseminating, globally, RDA outputs and perspectives with data practitioners active in their specific domain of expertise, encouraging them to become contributors and adopters of RDA outputs and to join the community; on the other hand providing insight and practical contribution to RDA groups and activities from the domain community and organisations they represent.